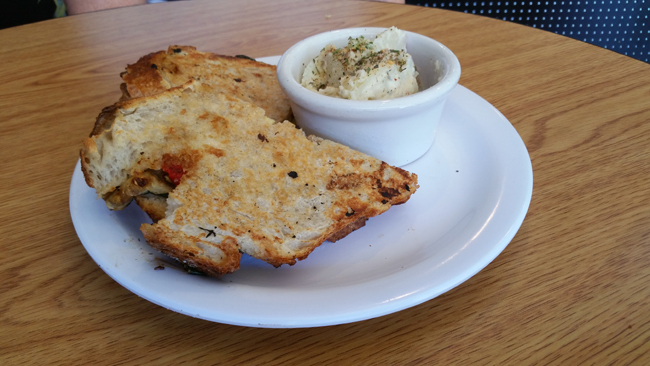 Green Erth Bistro – Persian Cuisine In North Florida, And It’s VEGAN! Having a meal at the Green Erth Bistro is like sitting down at the dinner table with your family in your own home. This restaurant is a little slice of heaven, hearkening back to a time when we sat down at grandma’s table for a homemade meal. All of the dishes are made simply with very fresh ingredients. Mashid goes to the market each day to select garden-fresh produce, which she and her staff prepare just prior to opening. The restaurant is designed so that vegans and carnivores can dine together, and everyone can get what they want. The owner, Mashid, is a marvelous lady who came to Jacksonville from New York. I spoke with her about her background and the restaurant. She came to the United States with her family at the age of 18. Originally from Iran, she describes herself as Persian. There is a delightfully comforting feel to this place that strikes you from the moment you walk in the door. A central high chair dining area features decor like you would find in your own kitchen, including an enticing jar of marinated vegetables. This is all by design. There are mirrors and items on the walls that add to the familiar homey ambiance. Green Erth has maintained a manageable size that allows them to offer excellent service without compromising quality and the intimate atmosphere. While advertised as vegetarian/vegan Persian food, I learned in my conversation with Mashid that this restaurant is vegetarian and vegan-friendly. After doing a little investigating, I discovered that they guarantee their vegan food is 100% pure. I discovered this place a few months ago and vowed to visit it for lunch, but I never made it. So, recently, as I was driving through downtown Jacksonville on Hendricks Avenue headed for a Tropical Smoothie Café, I passed this Green Erth Bistro. I turned around and headed back, intent on finding out what they were all about. I’m so glad I did; I had a wonderful lunch in a very comfortable setting with fresh ingredients that express themselves in unmistakable bursts of flavor. Let’s be honest with ourselves here, isn’t this what we all really want? I ordered a cup of the vegan soup of the day which turned out to be the Barley Aash. It is a hearty concoction of barley, lentils, navy beans, fresh herbs, garlic & onion and is very tasty. I also ordered a sandwich which is listed on the menu as a TempehWrap. This delectable wrap includes, organic tempeh marinated in-house dressing, served with diced tomato,onion and organic greens wrapped in lavash (a soft, thin flatbread), served with gluten-free chips. I could only finish half of the wrap as it was a sizable portion. Inquiring about their dessert, I was happy to find out that they have vegan desserts such as ice cream and the weekly special, which turned out to be the double chocolate cheesecake. The cheesecake is sweetened with agave which was pleasing to me since I avoid refined sugar like the plague. When I inquired about the desert, Mashid told me that she does not make them in her kitchen but orders the vegan desert from Shakthi Life Kitchens, located right here in Jacksonville. Shakthi Life Kitchens is owned by a young lady whose father owns European Street Café, which I posted in an earlier blog. In addition to the food that I ordered there are many other items on the menu that vegetarian/vegans will find delightful, like falafel, baba ghanoush, a hummus plate, tabouli, various salads, vegan chili, vegan soup, and various vegetarian/vegan sandwiches or wraps. One of the unique items in this restaurant is skewers and kebabs. I cannot wait to go back and try the organic tofu and vegetable kebob. You can also order sides of tabouli hummus, organic tempeh, vegan bread, vegan cheese, and basmati rice. Have I given you the impression that I could eat here every day? Well I’m glad I did, because it’s true. Lunch is served here Monday through Saturday 11 AM to 2:30 PM. Dinner isserved Tuesday through Saturday 5:30 PM to 9 PM and they are closed on Sunday. If you are traveling through Jacksonville this is a must stop. It is locatedin the downtown area on Hendricks Avenue. Please say hello to Mashid from Mike the Diver, and enjoy all of the great food choices she has to offer. Michael Wilkins is a respiratory therapist, an avid scuba diver and an accomplished photographer. He has been living with hepatitis C for more than two decades and is a cancer survivor. Michael has kept liver cancer at bay by employing the healing properties of a plant-based diet. A year later, after a strict plant-based regimen, his tumor markers are normal and his MRIs are clean! This has made Michael more passionate about staying on a vegan diet. He has met lots of wonderful passionate people with amazing stories while walking down this path. Michael’s area is Northeast Florida, particularly the Jacksonville area. Contact Michael to share your restaurant finds, make comments, or just to say hello! En-route to Tampa Bay, Florida, for their annual Vegfest, Rich and I stopped at a lovely little restaurant in Jacksonville to sample Ethiopian cuisine. Since I am in the midst of writing an Ethiopian cookbook, I’ve made it my business to try Ethiopian food in cities across the country, comparing and contrasting the different dishes, the methods of preparation and, of course, the variations in the Injera flatbread. 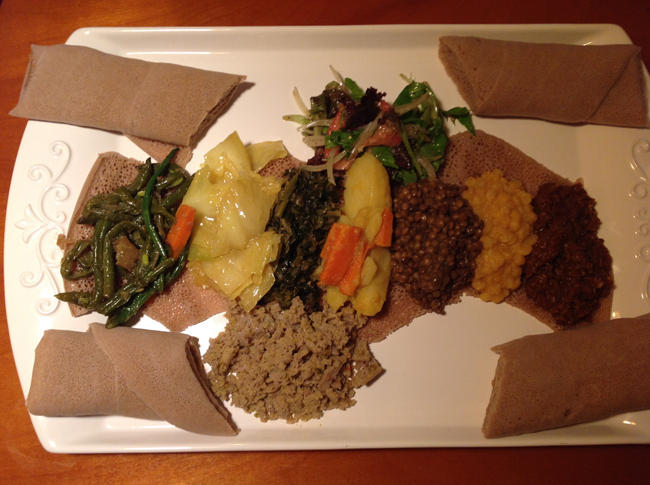 After many hours on the road, Ibex Ethiopian Kitchen was an especially welcome treat. 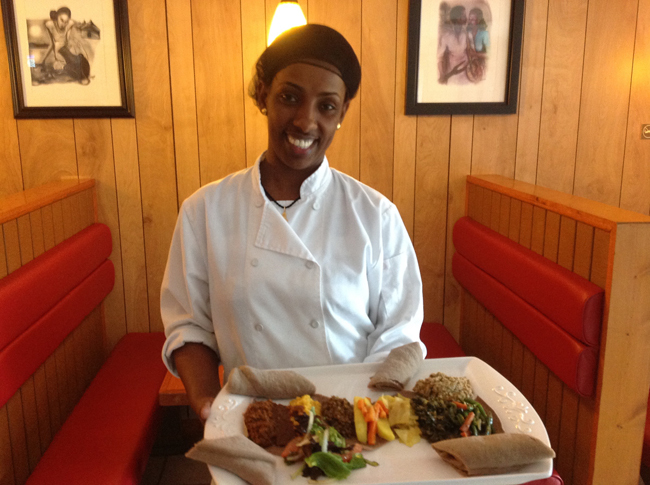 A little over 15 months ago, at the prompting of her best friend, Tsione (pronounced Tzani) Chiksemo moved to Jacksonville where she opened up Ibex Ethiopian Kitchen. Rich and I arrived after the lunch rush and we were greeted at the door by Tsione personally and we were joined shortly by her fiance Teddy Aboye. Ibex is named after a type of goat. Go figure, we never figured out exactly how this fits into the picture, but there you have it. If I told you we were going to have lunch at the Garden Truck, it would bring to mind images of a food truck located in a parking lot where one could stand outside to order food. In this case, The Garden Truck Eatery is a trendy restaurant located in North Jacksonville, Florida. I learned about this place through the North Florida Vegetarian Society here in Jacksonville. 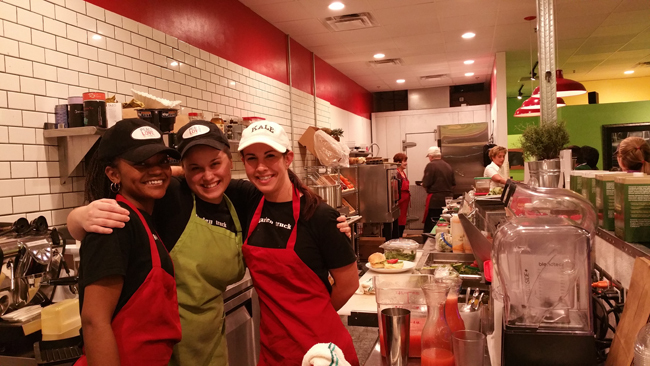 This Meetup group visits different restaurants in the area serving vegan options once a month. The Garden Truck Eatery was on their list one evening and we found it packed with happy hungry vegans and vegetarians. Ron and Gail surprised everyone by creating a sampling of most of their entire menu. Needless to say, everyone was delighted and vowed to return. 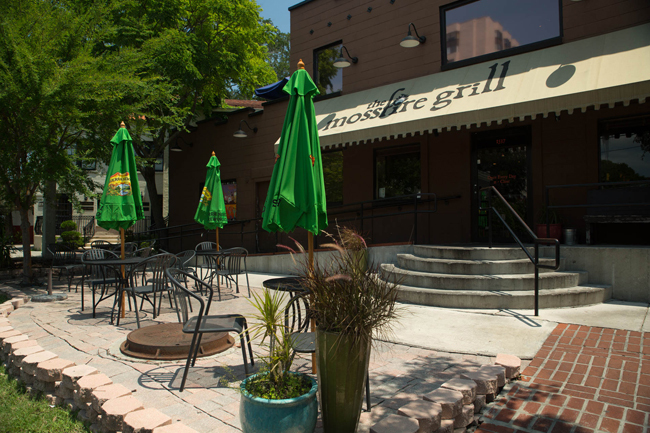 Enjoy Fresh Local Fare At Mossfire Grill, Jacksonville, FL! Today was my best friend’s birthday so we went out to dinner to celebrate at the Mossfire Grill. The food here is outstanding and one of the reasons is because this enterprise is a farm to table restaurant. For those of us who are not carnivores they offer dishes that include tempeh and tofu. The Mossfire Grill has a Southwest flair to their offerings and is located in the community of Riverside in Jacksonville. The specific area is called Five Points and the restaurant is a short walk from the five points intersection in the Riverside area of Jacksonville. European Street Café, A Favorite Vegan Meetup Venue In Northeast Florida. Jacksonville is fortunate to have a strong vegetarian/vegan community. 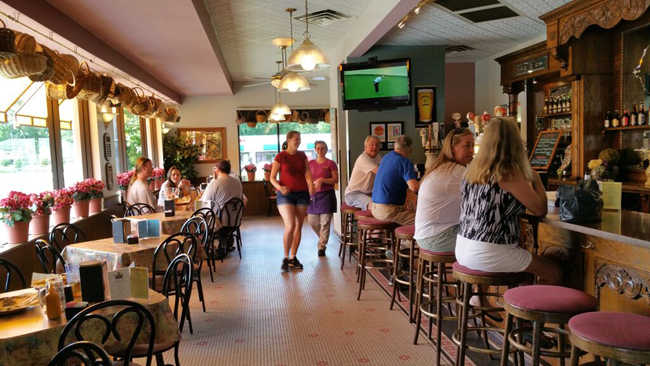 There are a couple of Meetup groups here that host regular functions. The Northeast Florida Vegetarian Society is Jacksonville’s vegetarian society and JaxRaw Meetup Group is for raw food enthusiasts. Recently I had the opportunity to attend one of these gatherings which convened at the European Street Café.